Asbestos.com is committed to providing the latest, up-to-date information to our visitors in the hopes of spreading awareness about the dangers of asbestos cancer. Follow this blog to stay up-to-date on treatment, research, clinical trials, doctors and survivors. 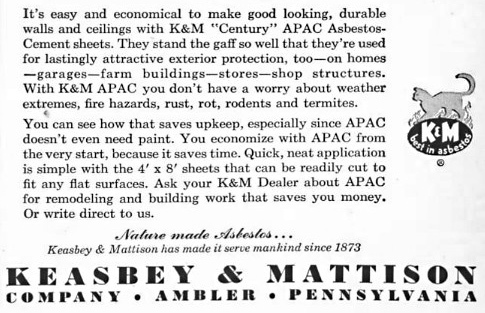 Keasbey & Mattison began as a pharmaceutical company in Philadelphia, but its fate changed when Dr. Richard Mattison discovered a way to produce insulation by mixing their laxative product with asbestos. If that seems absurd, just wait until you see the vintage advertisements for K&M’s asbestos products. 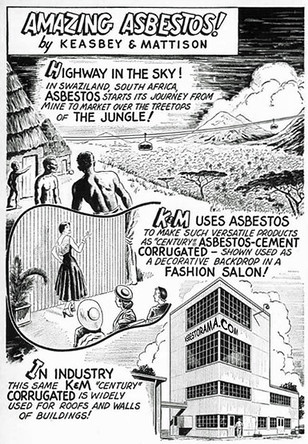 Asbestos advertising was common during the early to mid-20th century, when the American asbestos industry was consolidating its successes selling asbestos to the military and setting its sights on the wider civilian market. All industry leaders had to do was suppress every hint of medical research linking asbestos to horrible diseases such as lung cancer and mesothelioma. Instead of the medical evidence that had been accumulating since the late 1800s, the public was fed flashy advertising. 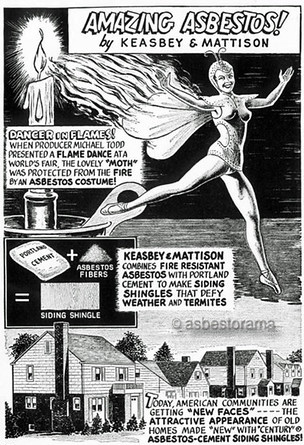 K&M’s ads were done in the pulp cartoon style of the early 20th century in order to evoke the supposedly heroic qualities of the “magic mineral” asbestos. 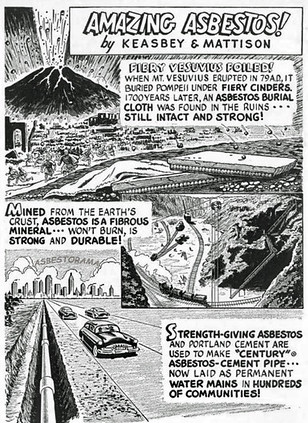 The cartoon proclaims, “Fiery Vesuvius Foiled!” — but the only thing the asbestos cloth saved from the volcano was itself. Asbestos is indeed more durable than the human body. This is precisely why microscopic asbestos fibers can cause a lifetime of cellular damage once they get stuck in someone’s lung tissue. Asbestos fibers outlast human cells, eventually driving the healthy tissue around them to scar or mutate. The Century brand cement pipes in the cartoon show that asbestos products remain in America’s urban landscape, where they will haunt future generations for a century and beyond. 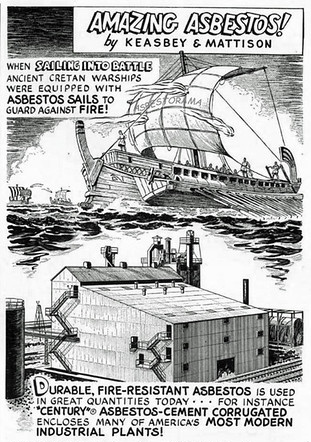 This cartoon draws a parallel between ancient and industrial times, celebrating applications of asbestos in both eras while concealing the historic tragedies of the asbestos industry. Ancient Greek and Roman scholars documented the terrible toll of lung disease among slaves forced to mine asbestos and weave it into cloth. In the industrial era, doctors across Britain, France, Italy, Austria and America began to note shortened lifespans for asbestos workers as early as the 1890s and the first decade of the 1900s. Putting Asbestos Directly into the Body — What Could Go Wrong? Though several doctors had written about the toxicity the asbestos dust by the 1930s, most medical professionals remained oblivious to its dangers, just as the public was. Coincidently, the pericardial sac (also known as the heart sac) gives its name to the disease pericardial mesothelioma, a rare subtype of the signature cancer caused by asbestos. South Africa was long one of the top asbestos exporters in the world. In addition to mining common white asbestos (chrysotile), the nation once supplied the majority of the blue asbestos (crocidolite) and brown asbestos (amosite) used around the globe. The rarer forms of asbestos have more needle-shaped fibers, which makes them even more dangerous than common white asbestos. Because of the vague symptoms of asbestos-related diseases, however, it was easy for asbestos companies to downplay illnesses among miners. South African cases of asbestos-related cancer were typically mistaken for tuberculosis. This misconception went on for decades until doctors started performing autopsies to see why antibiotics were not saving their patients. In their heyday, asbestos products were portrayed as futuristic novelties and affordable solutions to home makeover projects. A whimsical asbestos dance costume made for great advertising. But in reality, asbestos clothing was primarily worn by firefighters, naval gunners and workers operating high-temperature equipment. Because people associated asbestos with safety gear, home owners and builders seldom thought to wear protective equipment when working with asbestos construction materials. Today, regulations require workers to have industrial-grade respirators when they work with asbestos. K&M did not warn consumers to avoid asbestos inhalation while cutting asbestos cement, just as the company did not warn the factory workers who mixed the cement. The company also didn’t warn residents of Ambler, Pennsylvania, of the mountain of contamination it was building in their community. K&M’s founders moved their business to Ambler in 1881. Though the town remained small, the company’s facilities there went on to become major producers of asbestos-containing shingles, millboard, piping and tiles. The piles were neither covered nor enclosed by a fence. Rather, one of them had a public playground built on it. The playground was closed in the 1980s when the Environmental Protection Agency moved in to begin cleanup operations. The EPA cleanup in Ambler lasted more than 30 years, with the final phase of the plan released in 2017. 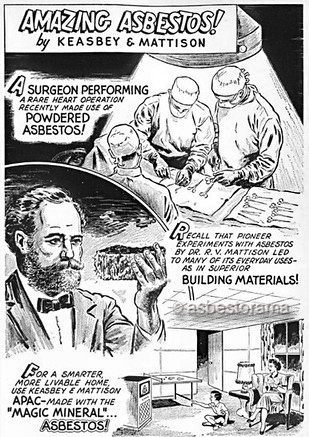 The post Vintage Asbestos Cartoons vs. Actual Facts appeared first on Mesothelioma Center - Vital Services for Cancer Patients & Families. The post 10 Shocking GIFs of Workplace Asbestos Exposure appeared first on Mesothelioma Center - Vital Services for Cancer Patients & Families. The post Cancer-Related Stress: Understanding Stress and Coping Effectively appeared first on Mesothelioma Center - Vital Services for Cancer Patients & Families. The post ADAO Set to Launch 15th Annual Conference appeared first on Mesothelioma Center - Vital Services for Cancer Patients & Families. The post Dealing with Mesothelioma Recurrence: Pick Up and Move On appeared first on Mesothelioma Center - Vital Services for Cancer Patients & Families. The post Meet the Group with Highest Mesothelioma Mortality Rate in the World appeared first on Mesothelioma Center - Vital Services for Cancer Patients & Families. The post Coping with Grief Through the Eyes of a Mesothelioma Widow appeared first on Mesothelioma Center - Vital Services for Cancer Patients & Families. The post Crisis Communication Best Practices for Mesothelioma Caregivers appeared first on Mesothelioma Center - Vital Services for Cancer Patients & Families. The post A Cancer Diagnosis 40 Years After a Hospital Renovation appeared first on Mesothelioma Center - Vital Services for Cancer Patients & Families. The post Announcing New Support Group for Mesothelioma Caregivers appeared first on Mesothelioma Center - Vital Services for Cancer Patients & Families.